On this date in 1865, Union and Confederate officials met to discuss an end to the Civil War. By now, the war had been raging for nearly four years, and the country was tired and heartbroken. Nevertheless, Union officials knew they had an advantage, and an agreement could not be reached. General W.T. 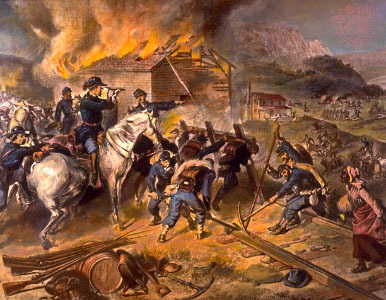 Sherman’s Union army continued their devastating march through the Carolinas in full force, following a successful campaign through Georgia as they chased down General Joseph E. Johnston’s troops. Sherman’s main target was South Carolina, since it was the first state to secede. He would later capture Columbia on February 17, 1865. Two days after the meeting between Union and Confederate officials took place, another battle broke out – this time at Hatcher’s Run (Armstrong’s Mill), Virginia. The battle would claim over 1,000 men (mostly Confederates).